Modine HSB 108 Air Handler. Used in commercial setting or Shop space heating. 110,000 BTU output with built in variable speed fan. Also used in commercial installtion for large heat dump capacity. Recommended for system up to 150 tubes (5 x TZ58 1800 30R). Can be used for summer dump zone. The Modine HSB-108 horizontal hot water/steam with Top and Bottom piping connections unit heater include an electrical junction box, either integral to the motor or mounted on the unit casing, to allow for easy electrical connections. 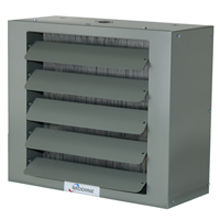 Horizontal delivery unit heaters are the most popular of all types. These units are ideal for heating buildings with large open areas and low ceilings. The Modine HSB Hot Water/Steam unit heaters are very quiet thanks to the use of careffuly selected motors, fans, and scientifically designed venturi fan shrouds. Modine horizontal steam/hot water unit heaters install quickly, easily and at low cost because they are lightweight. Yet they are ruggedly constructed to resist rigorous handling and on-the-job abuse. Adjustable horizontal air-deflector blades are standard with optional vertical blades available to permit complete air-direction control. A built-in safety guard provides protection from an exposed fan. Modine horizontal steam/hot water unit heaters are ideal for solar space heating of garage/workshops. These units work with Hot Water (83,700 BTU/HR w/ 200F water) or Steam (108,000 BTU/HR w/ 2 PSI steam). The total airflow at full speed is 2010 CFM.